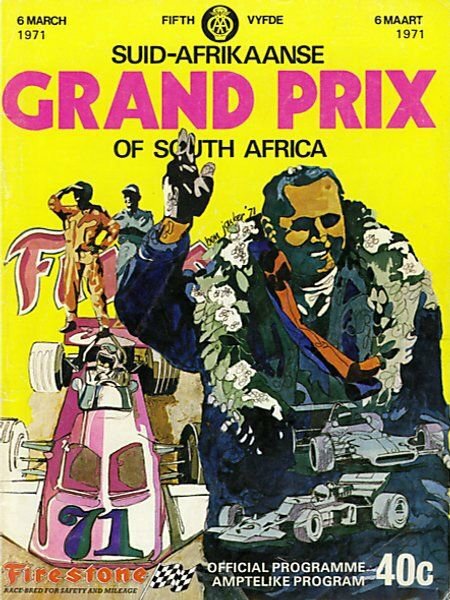 The 1971 South African Grand Prix, formally the Fifth AA Grand Prix of South Africa (Afrikaans: Vyfde AA Suid-Afrikaanse Grand Prix), was a Formula One motor race held at Kyalami Circuit on 6 March 1971. It was race 1 of 11 in both the 1971 World Championship of Drivers and the 1971 International Cup for Formula One Manufacturers. The race was won by Mario Andretti who was driving for the Ferrari team. It was expected the 12-cylinder cars would be dominant over the V8 Ford Cosworths – Ferrari had won four out of the last five Grands Prix in 1970, and they had a strong line-up consisting of Mario Andretti, Clay Regazzoni and Jacky Ickx. Jackie Stewart took pole in the Tyrrell to join Chris Amon and Regazzoni on the front row. Denny Hulme was suffering with a new suspension that he said was behaving very strangely. At the start, Regazzoni led the field away at the start – both Stewart and Amon suffering slow starts. Emerson Fittipaldi managed to hold off Hulme until lap three when he dived through to chase the Ferraris. On lap 17, he squeezed through under braking and the orange McLaren once again led a race. Pedro Rodríguez was forced to retire from fourth place when his bodywork started to melt and the hot air began burning his feet. The heat also took its toll on Jo Siffert, whose engine overheated and Howden Ganley who was taken ill with heat exhaustion. On lap 37, John Surtees who had steadily been moving up the field, managed to pass Regazzoni. Surtees however, suffered a gearbox failure on lap 57. Andretti took his first career victory, driving a Ferrari; his teammate Regazzoni finished in third place behind Stewart. ^ "Motor Racing Programme Covers: 1971". The Programme Covers Project. Retrieved 7 July 2017. ^ "1971 South African Grand Prix". formula1.com. Archived from the original on 17 October 2013. Retrieved 22 December 2015. ^ a b "South Africa 1971 - Championship • STATS F1". www.statsf1.com. Retrieved 20 March 2019. "chicanef1.com". Archived from the original on 22 July 2009. Retrieved 2009-07-08.